Water Circulation - how much is too much? I suppose it's too much if the current is ripping your plants and decor out of the substrate and if your fish are doing what they can to stay out of the current. I just put a AQ50 impeller in my AQ30 filter in an attempt to give my 17 gal a little more current and it seems to be working nicely; tank is still cycling though. Pattern8 and Pattern8 like this. I've pondered on this quite a bit myself. I have a heavily planted modified 12 gallon Fluval edge. After reading some anecdotal reports of possible low oxygen levels with this particular tank and size I replaced the Aqua clear 20 impeller (which comes standard) with the Aqua Clear 30 impeller. I haven't seen any increase in the sway of the plants but I do think there is increased surface agitation at the top as well as a wider distribution of co2 bubbles. Also, within days of the change I began battling an outbreak of green water algae that has taken me about a month to clear. I do wonder if the increased circulation might have caused more detritus on the substrate to be picked up and moved into the water column giving cause to the green water. I would shoot for a 10x turnover rate, coupled with a powerhead or two to direct flow across the front of the glass to create two swirls or one giant swirl. MasterAlgaeGrower and MasterAlgaeGrower like this. This was an interesting subject for me recently when I accidentally purchased an external canister filter rated to 370gph for a 13 gallon tank...way more than the 10x turnover that is often thrown around. Before the canister I was running dual Tetra Whisper 30 which wasn't too strong but absolutely made quite a current in the tank. I used to watch the shrimp jump off the wood into the stream and go swinging about in the tank; it looked like fun and the amount of times the shrimp would do it indicated that they were having fun also! They were also able to stay still when they needed to and the fish also had no problems just relaxing in the water as well. So I set up the new tank, made my nice little aquascape, put my plants in, and transplanted the fish, shrimp, snails, and filters into the new tank for a few days. Finally the canister arrives. I set that up, placed the intake and diffuser into the tank, primed it...instantly sand and gravel sediment blown around the tank with small plant bits following around in the hellish deep red tornado storm. Obviously the fish freaked out but the shrimp and snails managed to hold on for dear life onto the hardscape as the world around them was turned into a much more colorful transition scene of The Wizard of Oz. In short, yes you can have too much water circulation. I would say 25x the tank capacity flying through tiny spray nozzles per hour is approaching the definition of too much water circulation. Pattern8, Pattern8, TaylorTurner and 11 others like this. Well it's interesting addressing flow, in my opinion, in a freshwater planted tank. Marine life is used to surges of current, give the vastness of the ocean and storms and what not. But for an Amazon biotope tank like I have, it's hard to judge. You can have a source say "these fish/plants don't like high flow" but what is that number, what is high flow in that instance? I'm probably just over thinking it and you guys are saying this guy's an idiot, which you're not wrong haha but just wanted to see what anyone else thought like that. Instead of considering what the tank volume turnover rate is, try and determine where your fish and plants came from and research what the water velocity of the streams in the area is like. For example, the Amazon River water velocity ranges between 2.2 and 4.4 feet/second. The Bocaina stream in Bocaina National Park, Brazil has a water velocity of 0.32 meters/second, or 0.98 feet/second. 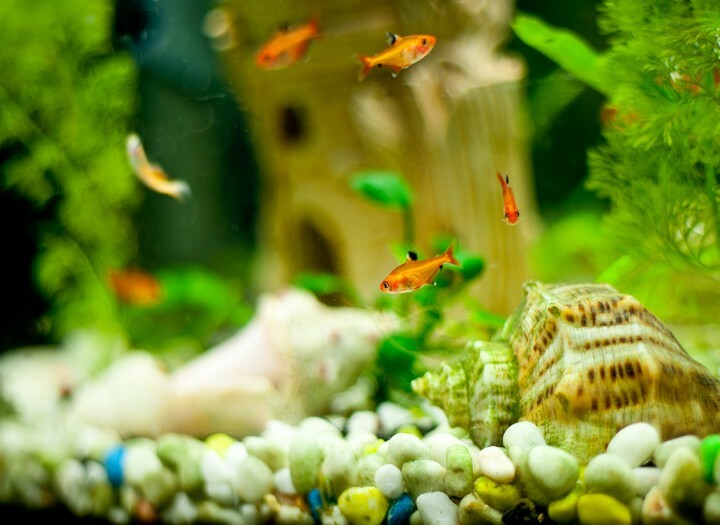 Place a measuring tape along the length of your aquarium and time how fast a piece of debris in the water column travels. Adjust your water flow accordingly. Pattern8, Pattern8, Very-Nerdly and 1 others like this. Hi all, I'm wondering if I have enough water turnover in my new aquarium. It's a 20 gal extra high (i know, weird... but it was a gift). I currently have two HOB filters running on it for a total of 300 gph, and also have an air stone in the bottom of the tank (it's the full width of the tank, running along the back. I'm concerned that I might not be getting enough circulation/oxygen near the bottom of the tank. I'm actually looking around for a water circulation pump and i haven't the faintest idea what size I need for my 55gal. I have a 350gph HOB filter (temporarily until I can get a canister). But I need a circulation pump that I want to place in the opposite corner and right over a CO2 diffuser (also, its a big dead spot that is accumulating debris). What gph should I be aiming for? Major believer in o2 and higher levels of it. No I'm not gonna explain, thats for you "Mr. Scientists'"
So, in my case should I get another, higher rated, filter? Or maybe a powerhead? There's no magic turnover number. People run successful tanks with no flow too intense flow. I've had tanks that ran pristine for years with an effective turnover of 1x. In a typical planted tank most of the filtration is taking place in the tank not in the filter so you just need some movement IMO. Cool. I guess it's the fact that it's so freakishly tall that concerns me. I ran a single Eheim 2213 on a 46G Bowfront for years. It's GPH out of the box is only 116. The tank was 20" tall. The most important thing you can do is change your water on a regular basis.